1. The December 2000 issue of Scale Aviation Modeller contains the information that a company called Helper Tech from the Czech Republic have released five sets of 1:48 resin figures, including #48005 which comprises three Helicopter pilots from the 101st LRRP. Also offered is Vietnam Decal set #1, 1st Cav. (Airmobile), with "enough decals for 18 helicopters, 1st Cav. tail badges and tactical signs for the 227th AHC, 1/9th Cav., the Blue Max ARA, and the 228th ASHB." 3. Amodel have released #72-50, the Army Mi-1MU version of their 'Hare', this one is armed with Falanga (Swatter) anti-tank guided missiles, which come on an additional sprue of 39 parts bristling with bombs, rocket pods, missiles, etc. The decal sheet has markings for just one Soviet aircraft. 4. The other new Mi-1 'Hare' mentioned in HKN #112 will be from the Russian company Gran. 5. The re-issued Heller 1:72 #80286 SA316B Alouette III 'Gendarmerie' is identical to the previous few issues of this kit except that the decal sheet has changed a little (one or two stencils deleted, red rotor tips included) and the instructions include assembly of the winch and rescue basket which were previously on the sprue but not used in this version. They have also changed the recommended shade of Humbrol gloss blue from Hu:48 Mediterranean to Hu:14 French. Also re-issued is #80289, the Sйcuritй Civile version of the Alouette III; this appears to be identical in every respect to the previous issue of this kit except that the box is slightly revised and the instructions have phone numbers and an email address. It's nice to see these kits readily available once again; they may be ancient, but they still build into nice models and new decal schemes are still being issued, for example Model Art #72/033 (HKN #106). 6. Revell's #4433 re-box of the 1:72 OH-60A Desert Hawk holds no suprises. The plastic in this is identical to that in the Italeri Desert Hawk #025 and to that in Revell's previous #4493 UH-60A / WS-70L. Decal options are provided for a sand & olive drab Desert Storm transport, serial 000, and for an olive drab gunship with TOW missiles and rockets from Ilesheim in Germany, serial 24532. 7. Bob Sanchez of Twobobs Aviation Graphics writes; "Bob Guere just sent me a peak of the Foreign User Cobra Sheet. Looks pretty good with a whole ton of stencil data on there. We got some great reference material from the guys at Bell Helicopter on that guy. They pretty much sent us their entire tech manual from their paint barn. Pretty nice of them." I suppose this means that sheet #48-005 (HKN #103) will be ready for release any day now. 8. 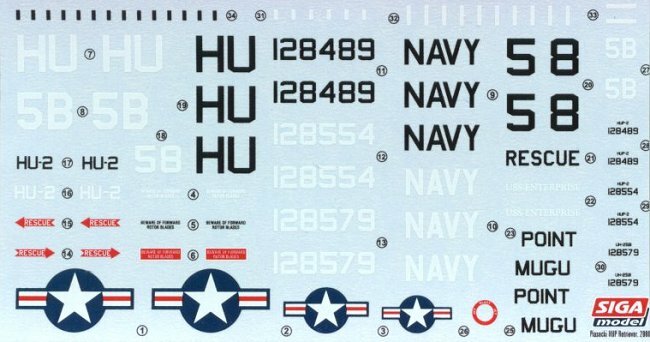 The decal sheet in the MM/Siga rebox of the Interavia Piasecki HUP-2 Retriever, (HKN #111) has decals for aircraft numbers 128489, 128554, and 128573. 9. Eduard have released etched brass set #72-336 for the Italeri AS.352 Super Puma. These are presumably designed for the Zvezda kits. The quality is said to be "perfect". Thanks to Drew Graham, Yevgeny Borissov, and Tony Morgan.